This site is growing daily and the material available is vast. Below is an explanation of how the site is organized and some ideas for finding the topic or audio that interests you. iON is an alphabetical archive of all the iON posts and Bob is an alphabetical archive of the Bob posts. Posts Archive is an archive of every post on the entire website in chronological order. You can use the “Labels” column (the far-right, third column) in Posts Archive to view topics or “Labels” for posts. Selecting any Label will bring up a chronological list of every post for that particular Label. You will also find “Labels” at the bottom of each individual post on the website. Selecting any Label will bring up every post (instead of a list of posts) chronologically with that label. Posts are limited to 10 per page, so if the Label you selected brings up more than 10 posts, scroll down the page to the bottom of the last post and select “Older Posts” to see more posts with that Label. Bob Dobbs and Bob Neveritt are the same Bob. When Bob was on Cash Flow at Achieve Radio, he used the moniker Neveritt to hide from the Church of the Subgenius. If the church members had found him, they would have invaded Cash Flow and chaos would have ensued. I used the Bob Neveritt label for all Bob Posts until the end of Cash Flow. BUT, the Bob Dobbs label includes all Bob posts—Dobbs & Neveritt. If you want to explore all things Bob, you can check out the Dobbstown website (you can always find this link on the Bob page just below the Payday candy bar image). Dobbstown was created by Scott Norris and though the homepage seems simple with a limited number of links, each of those links lead to more links. So there is a HUGE amount of Bob material at the Dobbstown website. The Bob link in the menu bar for this website (iON&BOb) contains not only an alphabetical archive of Bob posts but also begins with links to other websites with Bob content including his Facebook page, Timeline, Diaries, the Five Bodied forum and more, much more. Bob is HUGE. When searching the site, you have to do 2 searches. The first search displays a list of all the posts that contain your search. The second search shows you all the instances of your search word (phrase, etc.) on the post you select. First, use the search box at the bottom of this website, just to the upper right of Bob’s Payday radio photo. When you enter your search an overlay comes up with a list of each post that contains your search. Select the post you want. When your selected post opens, search that page using a browser search. On Windows, you can use the shortcut Ctrl+F and on Mac, Command+F. When the browser search box opens, enter your search to see all instances where your term shows up on that Post. So if you search for Howth as in Howth Castle, a list with 2 posts is displayed. 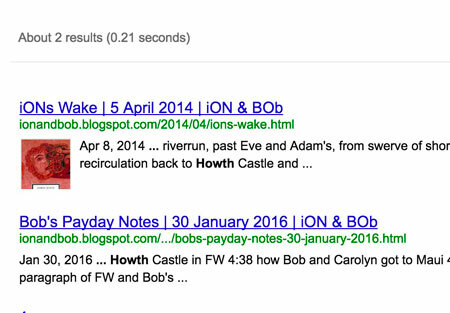 If you select the post “Bob’s Payday Notes,” and do a browser search on the page that opens, you’ll find 1 instance of Howth. Most of the iON&BOb website is audio so there is little text to search but because Bob is making extensive notes of the iON portion of the Payday show, the text in the Notes is searchable and you may be able to find what you are looking for because of his Notes.